Artefact Description Crocodile’s tooth in patterned cardboard box. 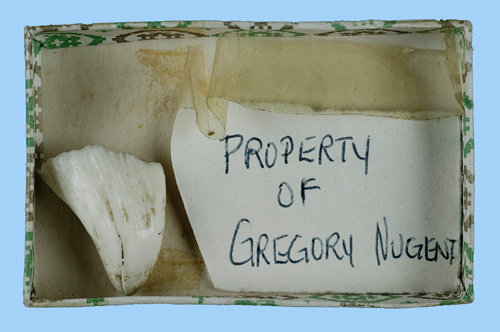 ‘Property of Gregory Nugent’ written on piece of paper inside the box by his mother. Loose piece of yellow cellotape in the box. The box may be a jewellery box lid. I lost that tooth in the summer of 1948 after a nasty accident involving a zookeeper, a can of lilt and an escaped marmoset. I have been unable to chew on the left-hand side of my mouth for over 60 years and, despite several lacklustre veterinarian attempts at dentures, I would appreciate it if you could return the tooth to me in my Autumn years at Dublin zoo. I think you will agree with me, that nothing is more important than a full set of gnashers. 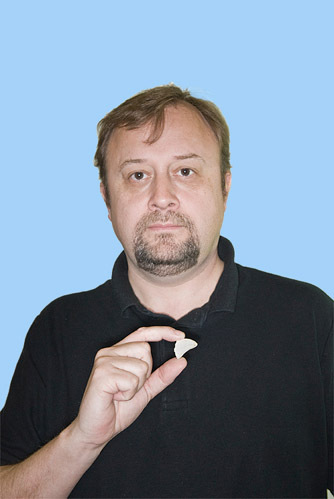 Thank you very much Christopher for getting in touch and sharing your memories, I am so sorry you have missed your tooth so much and lost it in such a traumatic manner. From my investigation of Gregory Nugent, I can assure you, he has preciously looked after and preserved your tooth for all those years. I feel he will be unwilling to let go of the tooth since it is such a treasured item and always reminds him of the good times with you! My sympathy is with you for if I recall my limited knowledge of crocodile teeth, the adult crocodile's jaw has pointed teeth which interlock and are suitable for grabbing, holding and tearing prey, rather than cutting or chewing. They have good teeth replacement as reserve teeth are continually growing and push out the older worn tooth. Food is crushed and torn into large chunks and then swallowed! I am so sorry that your tooth did not get replaced and that you prefer to chew and not just grab and rip! You must have a very placid nature. Also without the normal crocodile ability to replace your teeth, how many do you have you left? I hope you can find a good dentist.